Sort of. Kind of. I’m still scanning property listings, but alongside properties with horse potential we’ve been looking at just houses for less $$$ and within walking distance of a downtown. On Sunday, we went back for a third viewing at a house that we’ve both fallen a little bit in love with. We’re still cautiously investigating all of our options, but this is feeling really good. So that, for the first time, is the actual house we’re looking at. 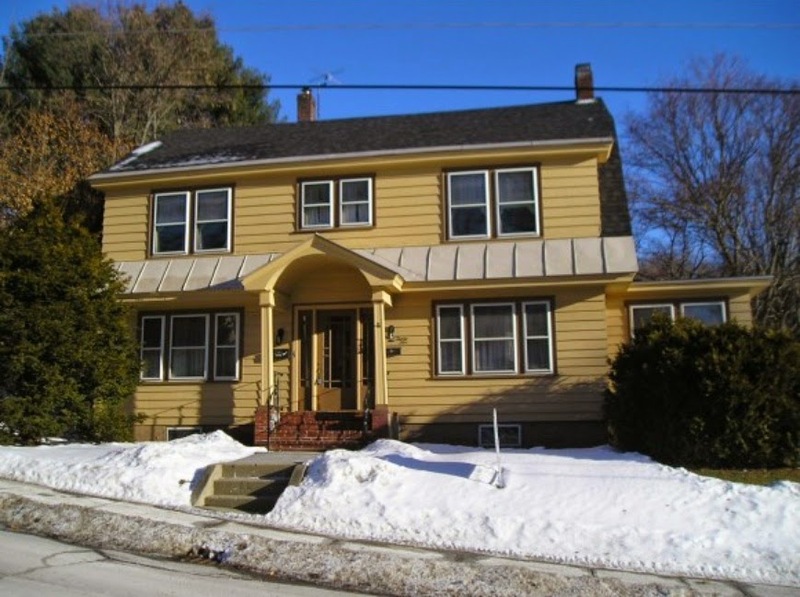 The basics: 4 bed, 2 bath 1928 Dutch Colonial. 2700 square feet on 0.5 acres (double lot). City water, city septic. Primarily oil heat powering a steam radiator system, but confusingly also has baseboard electric and a gas stove (the heating kind) in one room. Attached 2 car garage. The budget (1 being bottom, 5 being top): Let’s say a 2.5. The house by itself is a 2, but when we run the numbers on necessary renovations it moves to a 2.5. The pros: Exceptionally well-maintained, large kitchen, tons of space, huge living room, office space for me, man-cave space for the fiance, sun-room (on the right), sleeping porch. Gorgeous exposed original custom maple throughout – including hardwood floors in perfect condition under the current carpet. Nice but not spectacular neighborhood with an excellent location for both commutes, and 8 minutes from the barn (not that I timed it…). School system is somewhat meh but that is not really a concern for me. Overall, the biggest pro is how right it felt the first time we walked into it. Fiance and I haven’t agreed wholeheartedly on a house yet, and after 45 minutes in this space we were in love. The cons: Taxes are the highest of any property we’ve looked at. The city it’s in is on a definite upswing but it’s too early to tell how far that will go: will it become a trendy young professional city, or will it level off as the half-industrial city it currently is? Will property values really rebound? The size will make it expensive to heat through the winter, though it has a ton of room for energy audit improvements. Biggest cons: it needs a not-inconsiderable amount of rewiring to remove old knob & tube, and two new bathrooms. They are livable, but not terribly functional. Both are 75% gut jobs. It needs a few thousand dollars in energy audit improvements as well, though I would probably do that on any house we buy. The intangibles: It just feels right. I can’t explain it more than that. Oh wow. I love it! My reservations would be the size of the house on oil heat. Since it's towards the bottom of your budget, and you need to do remodeling anyway, what would the cost / plausibility(is that a word?) of adding in radiant heat to some of the common rooms? That might help cut down on your overall heating cost by making the rooms feel warmer. Radiant heat as in electric? That would end up costing more, I think. The steam heat system is actually pretty darn efficient, and one plus is that it effectively zones itself; we can turn individual radiators off. Another option is moving the weird gas stove into the living room, where there's a fireplace already equipped for a stove. That's not our favorite option, though. I think some energy auditing will go along way toward making the rooms more comfortable, too. All of the windows need to be re-caulked, and the basement needs to be air-sealed. Heating costs are definitely one of our biggest drawbacks, though! Thanks! Trying not to get too excited, but I agree – there's something that just feels right. So exciting! This is how so and I were about our house too. We stalked it for awhile before we were ready to buy and then when we finally looked fell head over heels for it. Both of us agreed whole heartedly it was the house for us and the updates that we would want to make.